2 Beds 3 Baths 1 Partial Bath 1,483 Sq. ft.
Ready to Move In & Enjoy! Light and Bright Unit! Fresh Neutral Paint. Carpets Cleaned. Upgraded SS Appliances & Front Load Washer & Dryer. Ceiling Fans. 3 Story Townhome w/Deck Off the Kitchen. Table Space in Kitchen AND in LR/DR if you prefer a Dining Room. Angled Open Area under Stairs for a Bar, Reading Nook or Toy Storage. 2 Master Bedrooms Each w/ Full Wall Closet and Private Bath. Perfect Floor Plan for Renting to a Friend or Generational Family Living. Office or TV Room in English Bsmt. 2 Car Attached Garage. Desirable Subdivision w/a Community Center, Dance /Aerobic Room with Classes, Inside Gym/ Basket Ball Court, Pool, Parks, Play grounds, Skate Park, Courts and Miles of Walking/Bike Paths. 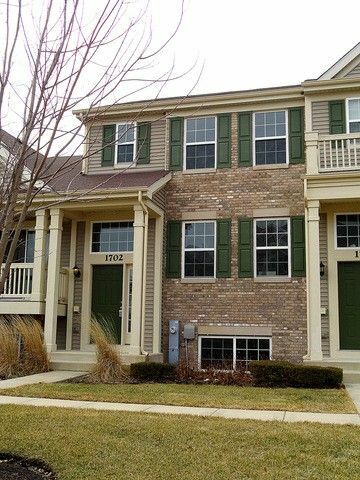 Parks are Right Around the Corner From this Townhome. Updated: EDO, All 3 Toilets, Disposal & Humidifier. Well Maintained. Quick Close Available. Great Price! Area Between Buildings in the Front is Very Attractive. Tons of Open Space. Convenient to Tollway, Rt 47, Rt 20 and 72.